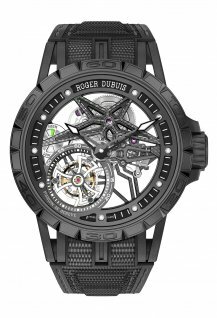 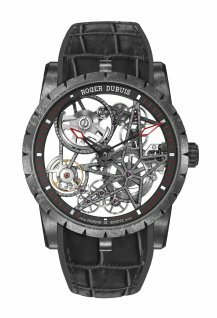 The Roger Dubuis' offering on Mr Porter includes a selection of six timepieces, along with a “one-of-a-kind” Excalibur timepiece. 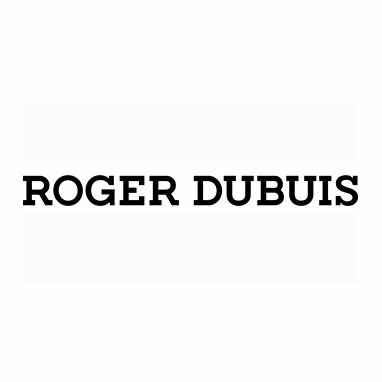 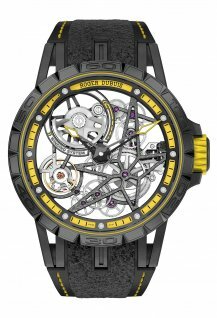 The upcoming launch of Swiss-based watch maison Roger Dubuis on MR PORTER is scheduled for Monday 19 November 2018. 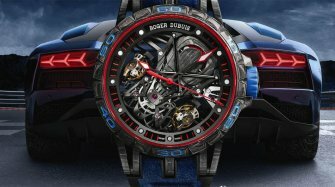 Within MR PORTER’s offering is an exclusive “one-of-a-kind” Excalibur Aventador S timepiece, built in partnership between Roger Dubuis and car manufacturer Lamborghini Squadra Corse. 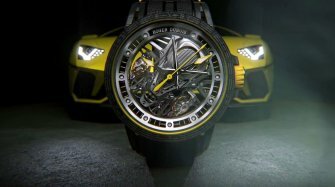 This unique piece houses a double sprung balance with a differential – both placed at 45-degree angle, and “engine strut bars” placed across the movement – highlighting design features of the Lamborghini V12 engine. These elements are placed within a light and agile titanium black DLC case. 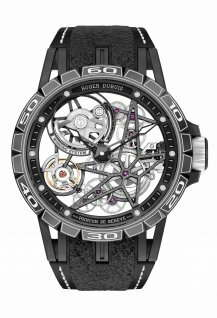 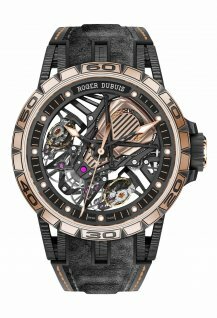 To complement the purchase of this unique timepiece, Roger Dubuis and MR PORTER will present the owner with a visit to the Roger Dubuis Manufacture in Switzerland, followed by an exclusive Lamborghini driving experience throughout the Jura Mountains. 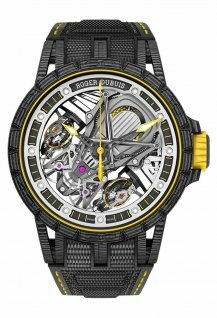 The additional Roger Dubuis timepieces on offer on MR PORTER include six timepieces. 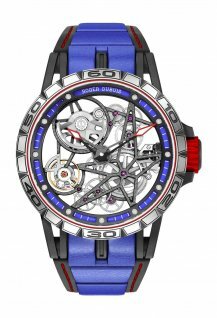 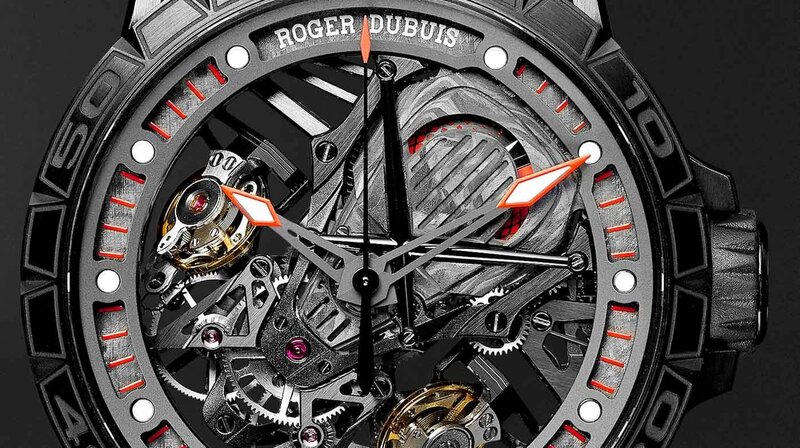 There are three timepieces from the Roger Dubuis and Pirelli collection, the Excalibur Spider Pirelli Automatic Skeleton in orange, red and blue accent colours. 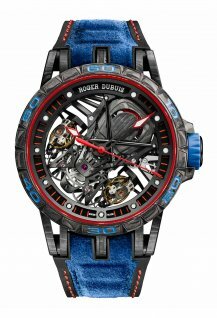 This unique partnership is famous for inserting motorsport winning tyre rubber into every watch strap; each reference is limited to 88 timepieces available globally. 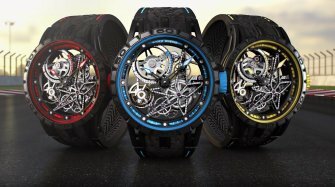 The other three models are the Excalibur Automatic Skeleton pink-gold timepiece with a calf strap, alongside Excalibur Automatic Skeleton timepiece titanium black DLC and Excalibur Skeleton Flying Tourbillon Carbon SMC with a rubber strap.